Numerous writers have undertaken the project of “cognitive mapping” since the Marxist critic Fredric Jameson deployed the term 30 years ago. 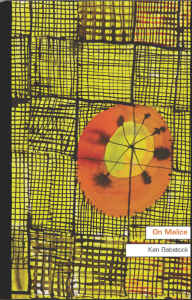 Two new offerings by well-established poets take up the challenge, employing experimental forms to provide new ways of representing the contemporary condition within the context of neoliberal globalization. The sequences in Ken Babstock’s On Malice each relate to questions of surveillance, a topical concern given recent revelations as to the extent of NSA spying on the general public, as well as questions around privacy and data mining on sites such as Google and Facebook. Babstock’s strategy replicates such aggregation. Most of the poetic sequences consist of found text: “SIGINT” incorporates Walter Benjamin’s records of his son’s language acquisition; “Perfect Blue Distant Objects” employs William Hazlitt’s essay “Why Distant Objects Please”; and “Five Eyes” uses John Donne’s essay “Biathanatos.” The original sources have been rearranged, reassembled, and rethreaded through Babstock’s heavily enjambed structures. “SIGINT,” the first and longest section in the book, is a sonnet sequence of sorts that “occurs,” as Babstock notes, in an abandoned NSA surveillance station atop Berlin’s Teufelsberg hill. These sonnets examine a situation in which the West’s gaze turns on its own subjects, justifying this redirection in the same terms – the need for security – as the outward gaze during the Cold War. “Perfect Blue Distant Objects” employs the language of Hazlitt’s essay to examine objects not necessarily of our natural world, but of a virtual world in which “Experience / enhances deception / in the cloud.” Technologies that claim to give us greater access to the world, or permit us to see more, actually invert that dynamic and put us on display. And yet we continue to upload our subjectivities, voluntarily dumping data into the net of surveillance, ignoring the reality that “all having is classified.” The play on “classified” here reminds us that the word embodies opposites: in the parlance of the intelligence community, “classified” can mean “secret,” but it can also mean data that has been calculated and categorized. Babstock’s employment of found – i.e., surveilled – text seems appropriate to the project, and is consistent with the practice of many of his contemporaries. The effect of reading the book is akin to perusing mined data and trying to assemble sense from it. 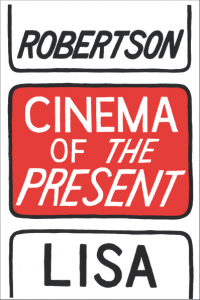 If Babstock’s book concerns itself with the subject of global surveillance networks, Lisa Robertson’s Cinema of the Present presents a more general subject. The text comprises a single long poem consisting of alternating sentences in italicized and unitalicized type, the plurality (if not majority) of which are either questions or statements involving the pronoun “you.” The second sentence of the poem reads, “You move into the distributive texture of an experimental protocol,” introducing an immediate ambivalence about the referent for this “you”: is it the reader? The “speaker”? Another subject? Notwithstanding the poem’s repetitive structure and iterated sentences, these questions are never answered with certainty, and indeed it is never entirely clear if this “you” is singular or collective. “What is a pronoun but a metaphor?” the text reads at one point, suggesting not only the inherently metaphoric nature of all language, but also the figurative potential of naming and gestures. The effect of reading here is cinematic in the etymological sense: the root of “cinema” is the Greek word kinema, meaning movement, and as one reads Cinema of the Present, the alternating sentences do produce a kind of kinetic effect akin to the flickering images of projected film: “moving surfaces that intersected sequentially and at varying angles.” The poem has its roots in the “new sentence” practice of the language poets in the 1970s and ’80s, and certainly invites attention to individual sentences, but to me the effect is primarily accumulative, the reading best performed in a single sustained sitting. This would not be a contemporary poem if Robertson did not employ a procedural constraint of some sort, and here it is that the italicized sentences – with the exception of the first and the last four sentences – proceed in alphabetical order, while the non-italicized sentences are not inhibited by this requirement. The poem presents an italicized “baseline” against which the less-constrained sentences bump and echo. “Cognitive mapping” might actually be inaccurate: these books are less cartographies aiding the navigation of our world, than sounding boards amplifying our disorientation within it.